This article aims to help you restore encrypted files from your hard drive if it has been infected by Petya GoldenEye Ransomware (other variant is known as Petya Eternal, ExPetr, PetrWrap, NotPetya). 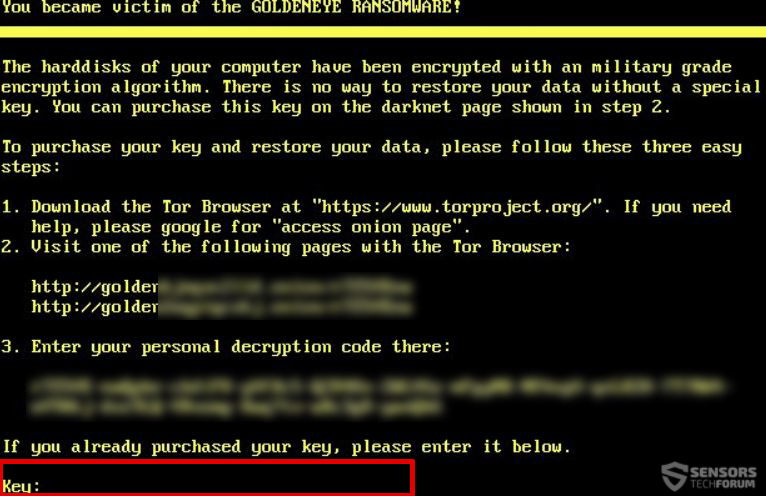 The new ransomware outbreak of GoldenEye ransomware has been reported to target primarily Ukraine, but the malware quickly spread all over the world. This virus aims to encrypt all of the files on a hard drive and the MBR of the drive itself, making it virtually impossible for you to restore your files even if you pay the ransom. Researchers at Kaspersky have detected that the encryption routine of the new Petya/NotPetya virus is designed so that even if a payment is made, the ones behind the virus cannot decrypt your hard drive, even if they wanted to. 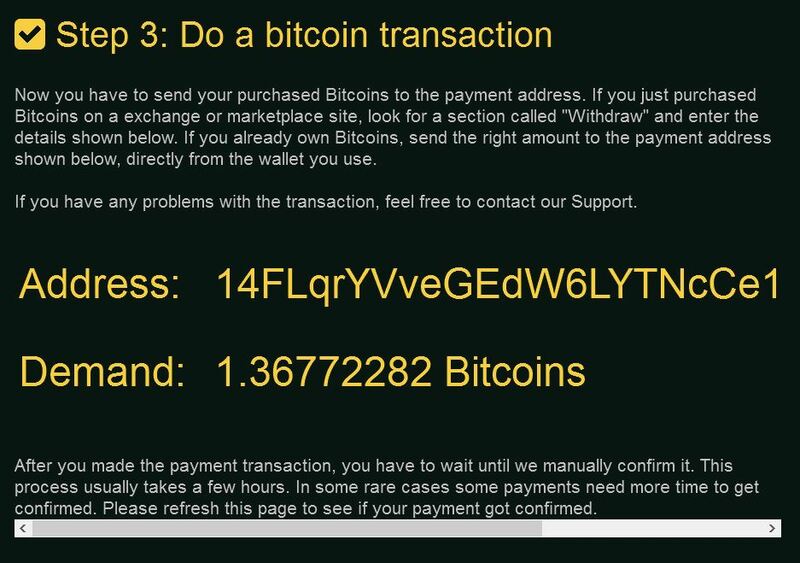 So if your computer has been infected by this latest GoldenEye variant, you should also not pay the ransom and read this article to learn how to try and get your data back. Short Description Separate variant of Petya/NotPetya ransomware. Encrypts the MFT (Master File Table) and the files on the infected computer, demanding $300 ransom payoff. Symptoms A reddish lock-screen on boot, demanding $300. User Experience Join Our Forum to Discuss GoldenEye Ransomware. The primary method by which this nasty infection was detected to spread is very sophisticated and very effective. For starters, the cyber-criminals behind the GoldenEye Petya Ransomware have taken advantage of the earlier detected leak of exploits by TheShadowBrokers hacking group, which released multiple exploits for Windows operating systems. One of those, named ETERNALBLUE may have also been used for the GoldenEye Petya virus. However, the actual method of infection is even more interesting – similar to Petya/NotPetya, the virus may get into enterprise computers via an update, quite contrary to what WannaCry ransomware did. Instead of update, the victims receive a malicious executable which is obfuscated to avoid detection by antivirus software. From there, the virus force restarts the computer and begins it’s malicious activity. Other methods by which GoldenEye ransomware can infect your computer include spam e-mails which aim to get you to click on suspicious e-mail attachments. The first thing done by GoldenEye ransomware is to cause a system restart by ending vital system processes on the infected computer. Then, the virus modifies specific firmware settings on the infected computer to allow it to run on boot. As soon as the victim PC is restarted, the virus begins to pretend that it is actually fixing the file system on your system drive. But if you see the screen below you should immediately switch off your computer and take out the drive to salvage the damage that is done by GoldenEye Petya on your computer. The web page has the communism logo along with the name of the virus. 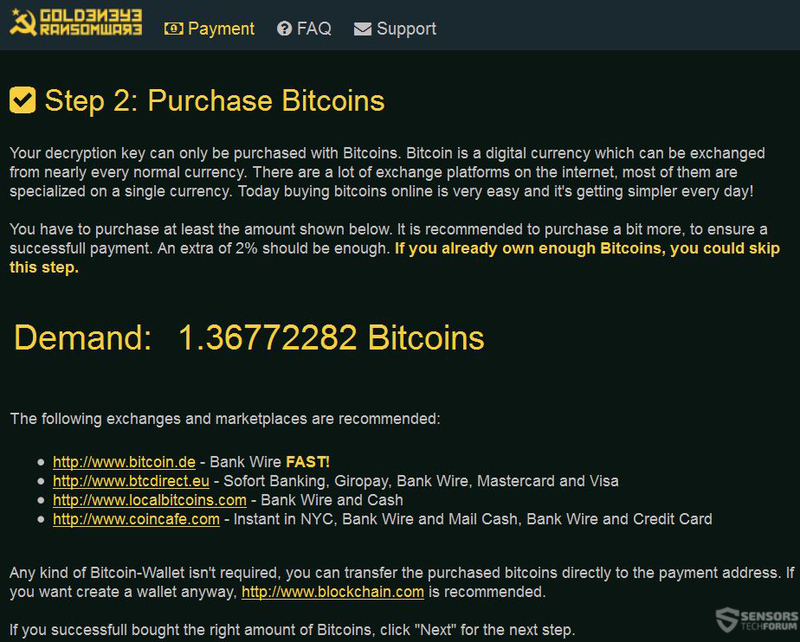 It also has a step-by-step instructions on how to pay in BitCoin in order to get the files recovered. 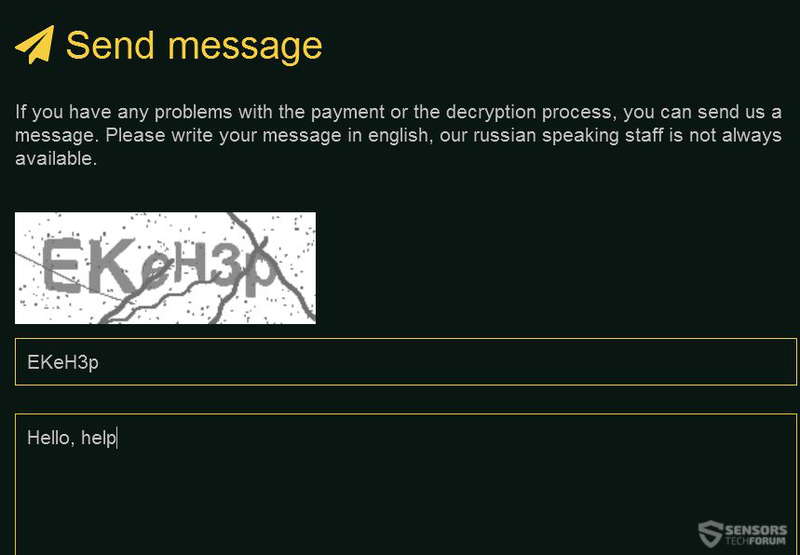 The GoldenEye ransomware has a chat, where you can communicate with the cyber-criminals. When we sum it up, GoldenEye is basically an updated variant of the combined Petya and Mischa ransomware viruses. The cyber-criminals have updated it’s encryption algorithm and have even added captcha identification. 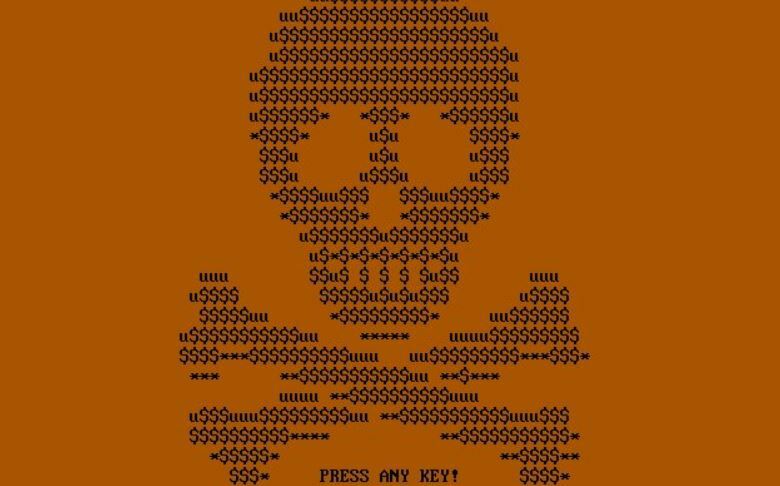 For the moment security experts strongly advise victims not to pay any ransom to both Petya GoldenEye and Petna ransomware viruses primarily because they are believed to be developed as cyber-weapons and aim to render the entire drive of the infected computer unusable. SATA to USB cable – you can find it very cheap (around $2) in every tech store. A secured laptop or desktop PC. 1. Backup all your files in it via a cloud backup software or other methods. 2. Download a relevant malware-protection program to scan the PC. 3. Download a decent data recovery program. Any program will do for you, as long as it supports lost partition recovery. Threats such as GoldenEye Ransomware may be persistent. They tend to re-appear if not fully deleted. A malware removal tool like Combo Cleaner will help you to remove malicious programs, saving you the time and the struggle of tracking down numerous malicious files. Threats such as GoldenEye Ransomware may be persistent on your system. They tend to re-appear if not fully deleted. A malware removal tool like SpyHunter will help you to remove malicious programs, saving you the time and the struggle of tracking down numerous malicious files. Note! Your computer system may be affected by GoldenEye Ransomware and other threats. SpyHunter is a powerful malware removal tool designed to help users with in-depth system security analysis, detection and removal of threats such as GoldenEye Ransomware. 1. Install SpyHunter to scan for GoldenEye Ransomware and remove them. 2. 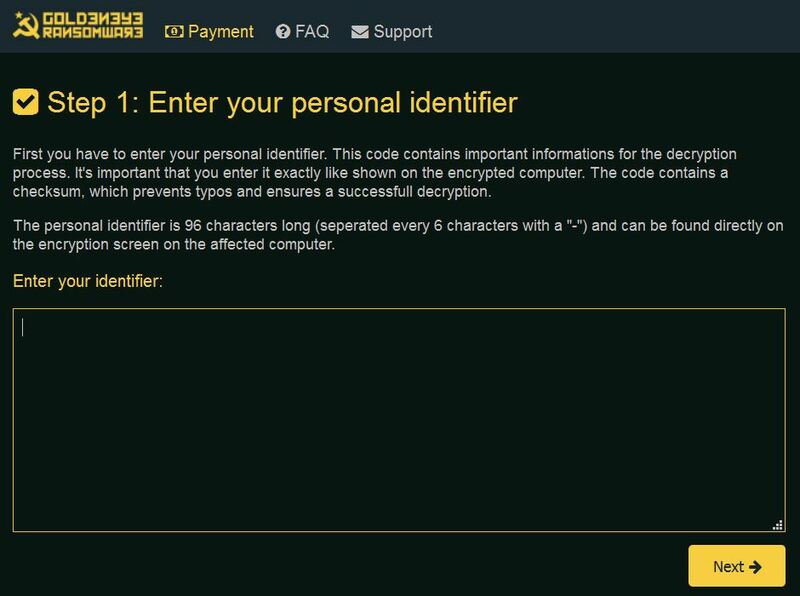 Scan with SpyHunter, Detect and Remove GoldenEye Ransomware. Ransomware infections and GoldenEye Ransomware aim to encrypt your files using an encryption algorithm which may be very difficult to decrypt. This is why we have suggested several alternative methods that may help you go around direct decryption and try to restore your files. Bear in mind that these methods may not be 100% effective but may also help you a little or a lot in different situations. Note! Your computer system may be affected by GoldenEye Ransomware or other threats. Remove GoldenEye Ransomware by cleaning your Browser and Registry. Fix registry entries created by GoldenEye Ransomware on your PC. Combo Cleaner is a powerful malware removal tool designed to help users with in-depth system security analysis, detection and removal of threats such as GoldenEye Ransomware. Step 5: In the Applications menu, look for any suspicious app or an app with a name, similar or identical to GoldenEye Ransomware. If you find it, right-click on the app and select “Move to Trash”. Step 6: Select Accounts, after which click on the Login Items preference. Your Mac will then show you a list of items that start automatically when you log in. Look for any suspicious apps identical or similar to GoldenEye Ransomware. Check the app you want to stop from running automatically and then select on the Minus (“–“) icon to hide it. Remove GoldenEye Ransomware – related extensions from your Mac’s browsers. A pop-up window will appear asking for confirmation to uninstall the extension. Select ‘Uninstall’ again, and the GoldenEye Ransomware will be removed. When you are facing problems on your Mac as a result of unwanted scripts and programs such as GoldenEye Ransomware, the recommended way of eliminating the threat is by using an anti-malware program. Combo Cleaner offers advanced security features along with other modules that will improve your Mac’s security and protect it in the future. Hey !, I found this information for you: "GoldenEye Ransomware – Restore Files (July 2017)". Here is the website link: https://sensorstechforum.com/goldeneye-ransomware-restore-files-july-2017/. Thank you.